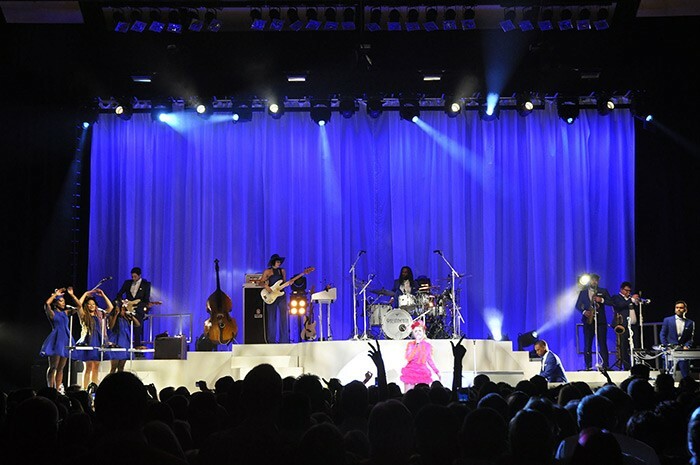 Entec continues its lively working relationship as a lighting supplier to one of the UK’s most innovative, interesting and successful contemporary artists, Paloma Faith; working closely with LD Tony Austin and lighting director/programmer Phil White. Known for her eccentric retro style, Faith’s music career goes from strength-to-strength with another chart topping album and a 2015 Brit Award for best Female Solo Artist. 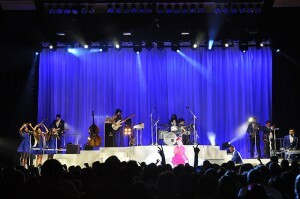 She has been touring for around the last six months including a spring outing for which Entec supplied the full lighting rig. The shows have continued into the summer with the floor elements of the rig modified as a specials package for festivals and headliner gigs. The full rig comprised four overhead trusses with two side trusses, for which Entec invested in a new Doughty Engineering H-Frame system which is highly versatile. It proved the ideal solution for fitting into all types of venues as it pins together block-by-block to make up a consistent, straightforward to rig drop system to provide the side lighting positions. Having this on board also ensured the fixtures could be located in the same desired positions every day. Side lighting was essential for Faith’s theatrical delivery. The ladder trusses were slightly angled off stage towards the audience at each show, enabling lights rigged on them to fire across the stage and also catch the full slightly ruched white upstage backdrop. In front of this 65ft. wide by 35ft. high full white drape were six variable swags, longer off stage and shorter on stage, which Entec helped source for the production. The multi-level circular set designed by Joshua Grace stood directly in front of this and was also white, stepping up to a high level at the back. Upstage of the white were eight strings of egg-strobes for disco moments. Entec supplied 32 Martin MAC Viper profiles which were distributed between the trusses and the side ladders and they were the main workhorses of the rig, chosen for their power and flexibility. Tony used a lot of defocused gobos which looked highly effective on the white set yet off-beat enough not to be immediately recognisable for what they were. Joining these on the floor were another eight Clay Paky Sharpy Washes on tank trap bases, four behind the band, with two sets of two either side of stage lighting through the backing vocalists and the musical director and on to the forestage. They contrasted well with the two layers of Vipers on stage: the four behind the band and the four white ones in front of the set plus two more on the downstage edges. Faith likes white light, so the first few numbers were lit completely in different variants of white, with colours then being introduced – strikingly – first from the washes and then from the profile fixtures. Tony and Phil ran the show in tandem from two networked grandMA2 light consoles at FOH as multi-users sharing the same show-file, with Phil taking care of all the moving lights, general lighting and effects, and Tony kicking in on the accents and highlights and running the strobes, conventionals and key lighting, whilst calling followspots. Entec’s crew for the main tour were crew chief Nic Burlace, and technician Aamir Riaz. Tour rigger Richard Brennan was employed directly by the production which was managed by the inimitable Derek Fudge. Entec’s project manager Noreen O’Riordan comments: “I think this tour has been the best yet, the production teams led by Derek work incredibly well together to achieve the high standards that Paloma commands and deserves”.